Firstly, Dr Lesley Hardy and her colleagues at CCCU, Drs Mike Bintley and Ellie Williams, with Dr Andrew Richardson and his team from Canterbury Archaeological Trust [CAT] have gained Heritage Lottery funding for their ‘People before Us’ community-based project at Folkestone. I believe one of the first tasks will be to record the gravestones in the churchyard and this is about to begin. If you would like to know more about the project and what the archaeologists and others will be doing, please do contact Lesley at lesley.hardy@canterbury.ac.uk because amongst the events this week are a talk tonight (Tuesday) on ‘Anglo Saxon Kent’ by Andrew Richardson and on Thursday 13th July by Charles Bain-Smith (National Trust) entitled ‘Conservation and Spirit of Place’. These talks will take place at St Mary and St Eanswythe church at 6pm. After Mr Bain-Smith’s lecture, there will be a guided tour of the church. Also taking place this week are ‘hands on archaeology’ sessions: on Tuesday 11th & Thursday 13th these comprise ‘archaeological bones’ sessions (2-3pm) in the graveyard, and on Thursday 13th ‘an archaeological finds’ session (3-5pm). In addition, there will be a public meeting on Saturday 15th July to discuss what the archaeologists have discovered. Do go along to any of these if you are interested. One of the knights setting off for the Medieval Pageant parade. Next, as reported last week, Dr Michael Jones is launching his new book on the Black Prince at the CCCU Bookshop on the Canterbury campus on Wednesday 19 July. This will take place at 5pm and if this sounds interesting please do come along. Some of you may remember that Michael gave a lecture on the Black Prince at the Medieval Canterbury Weekend in April 2016, and his new study will expand on the ideas he discussed last year. Members of the Centre are off giving papers at conferences at the universities of Lincoln, Leeds, Reading, and later in the summer Essex, but nearer to home they are also engaged in presenting at conferences and festivals. Among these, I will be speaking at the ‘One-Name’ Studies conference at Chartham on Saturday 15 July on Canterbury medieval civic records. Cressida Williams, the head of Canterbury Cathedral Archives and Library, is similarly speaking at the conference on what looks to be a very interesting programme. Then the week after on Thursday 20 July to coincide with Faversham’s Nautical Festival I’ll be at 12 Market Place (opposite the Guildhall) to give a talk on the Kentish Cinque Ports in the Middle Ages looking, in particular, at their custumals and the importance these ports placed on civic elections. Keeping with this maritime theme, my colleague Dr Martin Watts, as part of Whitstable Harbour Day on Saturday 5 August, has compiled a guided walk around the harbour and foreshore with the help of Brian Baker, a recently retired Canterbury City councillor. This is only a small part of a much wider project on Whitstable’s maritime heritage, and on 5 August Martin and Brian will be on hand to answer questions – do go and talk to them if you are in the area and are interested in this historic coastal community. 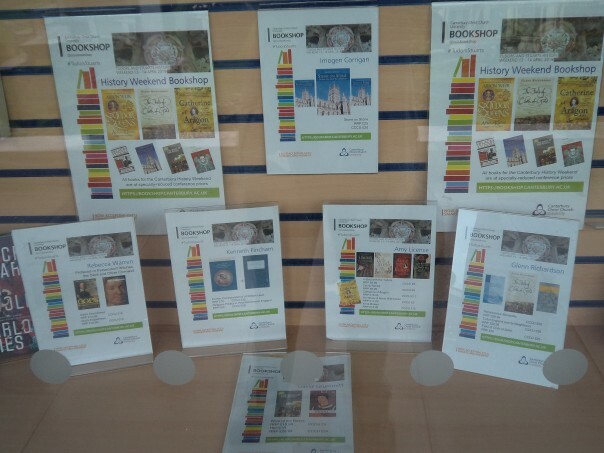 Looking forward to the early autumn, the Centre has a number of events coming up (more may be arranged later, so please do keep an eye on the Centre’s ‘Events’ page) and I think the easiest way is to run through them chronologically. The first of these is an open lecture on Sunday 3 September at 7.30pm as part of the 68th Sachsensymposion to be held at Canterbury and involving both universities and CAT. Paul Bennett will give this public lecture and once I have final details I will let you know. Then at the end of that week on Friday 8 September, all are welcome to Professor Sandy Heslop’s lecture on ‘The Organisation and Decoration of St Anselm’s Crypt in Canterbury Cathedral’ at 6.30pm in Old Sessions House, Canterbury Christ Church. Professor Heslop is an eminent medieval art and architectural historian, and his talk will explore the meanings of the fantastic beasts and hybrids that adorn the crypt capitals and the significance of the crypt as sacred space – sounds fascinating! 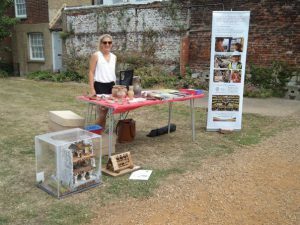 Isobel and the Canterbury Archaeological Trust stall at the Medieval Pageant. Later in the month, on Thursday 21 September at 7pm in CCCU Newton, Ng07, the Centre and the Friends of Canterbury Archaeological Trust [FCAT] will hold a joint lecture at 7pm. The Centre’s Visiting Professor Paul Bennett MBE and Director of CAT will discuss his and the Trust’s archaeological work in northern Iraq regarding the discoveries of the remains of Neanderthal man. Although the site is not new, recent discoveries have greatly expanded our knowledge of these prehistoric people and this is a very exciting time for all those engaged in the study of Man’s origins. The following week and closer to home on Wednesday 27 September the Centre will be hosting another joint lecture, this time with the Agricultural Museum, Brook. Booking is not required for this Sixth Nightingale Memorial Lecture, so please do come along to Old Sessions House from 6.30pm for the drinks reception (the lecture will start at 7pm). Tony Redsell OBE will consider ‘Hop Growing in Britain: Past, Present and Future’. He is one of Britain’s leading hop growers and farms in east Kent, and his contribution to hop growing and to the industry is legendary having been Chairman of the British Hop Association for four decades. Keeping with the theme of plant growing, the Centre is holding a one-day garden study day ‘From Monastic to Tradescant Gardens’ on Saturday 7 October from 10.00 in Old Sessions House, Canterbury Christ Church. The day is being arranged in conjunction with Canterbury Cathedral Archives and Library and will involve talks, workshops, tours, and an expert panel session. Among the contributors are Dr Jayne Wackett, who is a guest lecturer at The Eden Project, Dr Barrie Juniper, Reader Emeritus in Plant Sciences, Oxford University and the author of The Tradescant’s Orchard and Karen Brayshaw, Canterbury Cathedral Librarian. November will bring the second of the joint Centre and FCAT lectures when, on Thursday 16th, Clive Bowley, a local expert, will discuss timber-framed building at 7pm in CCCU, Newton Ng07 – all welcome. Martin Watts will be involved in organising events linked to the Armistice Centenary, but at the moment I have no further details. The re-enactors camp in the Greyfriars Gardens. Now to the Medieval Pageant last Saturday that began just outside the Westgate and finished at the Marlowe Theatre, and included speeches by ‘King Henry II’ and ‘Queen Eleanor’, fanfares, giants, knights, other medieval characters and various school and other groups. After the parade, many of the re-enactors, including the two knights returned to their encampment in the Greyfriars Gardens close to the Centre’s stall. This proved to be a favourable position and Professor Louise Wilkinson and her team of two staff members and two students welcomed over 600 visitors to the gardens. In particular, the two students, Victoria and Charlotte, helped the many children and their parents with shield design activities (as you can see), including the different symbolism of colours and emblems. 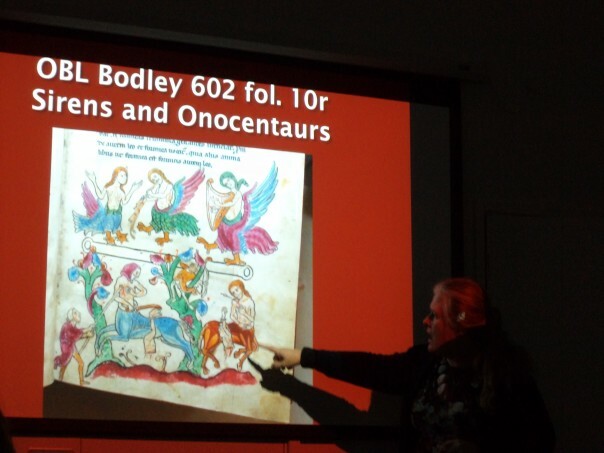 Dr Diane Heath had very kindly brought along ‘fabulous creatures’ for others to colour in and those who preferred something different could label a drawing of a knight or colour in a scene of a lady in her castle. All of these activities proved to be very popular and most children and parents went off to see the re-enactors camp at the end of the gardens clutching their stamped Family Trail map, their shield or other artwork. Victoria helping children and parents to design shields. 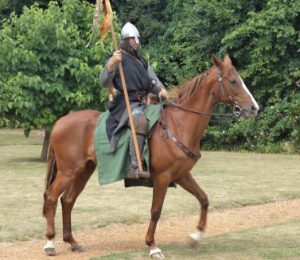 As you might expect, many stopped to talk to the horses and ask about the knights’ weapons and their clothing, and in the encampment itself were other men-at-arms on foot who showed off their fighting skills and talked knowledgably about chain mail, swords and battle-axes. 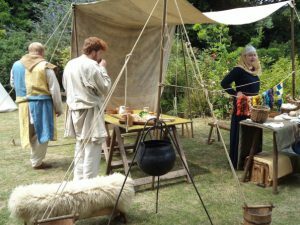 For those of a less warlike disposition, a priest was happy to talk about medieval religion, and other ‘medieval’ women and men explained to the curious what they ate, how they made their clothes and what sorts of trades they engaged in. Many of the re-enactors regularly take part in the annual ‘Battle of Hastings’ and for those who are interested in finding out more, this group has a long hall (and a long ship) behind Wildwood Wildlife Park to the north-east of Canterbury. Also stationed in the gardens was Isobel Curwen and the CAT stall. She, too, had a stream of visitors of all ages who wanted to know about the archaeological work of the Trust. Isobel, as you can see, had a variety of finds on display that people could handle, as well as a model castle and battering ram that were very popular, especially with the children. 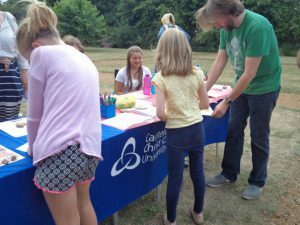 Just like the Centre, such outreach work is an important aspect of the Trust’s educational activities and the two stalls complemented each other very nicely. Indeed, we were still welcoming people almost up until the event finished at 5pm which suggests that the event has become a valued part of the city’s calendar.